UPDATED: The Bishop’s Address is now available (see below). The Bishop of the Episcopal Diocese of Central Florida, the Rt. Rev’d John W. Howe, has announced his intention to retire in April 2012. and has called for the election of a bishop coadjutor. Bishop Howe, a long time leader in the orthodox wing of the Episcopal Church, is one of the founders of the Communion Partners. He was became the third Bishop of the Diocese of Central Florida in 1990. Bishop Howe was ordained deacon in 1967, priest in 1968 and became Bishop Coadjutor of the Diocese of Central Florida on April 15, 1989. He earned a B.A. in philosophy, University of Connecticut, in 1964 and M. Divinity, Yale Divinity School, 1967. He was awarded Doctor of Divinity degrees from Yale in October 1989, from University of the South, Sewanee, in 1990 and from Nashotah House in 1991. He was President of the University of Connecticut Christian Fellowship from 1962 to 1964, a staff member of InterVarsity Christian Fellowship 1964-69, and served as chaplain at both The Loomis School, Windsor, Connecticut, 1967-1969 and Miss Porter’s School, Farmington, Connecticut, 1969-72. In 1972, Bishop Howe became Associate Rector, at St. Stephen’s Episcopal Church in Sewickley (Diocese of Pittsburgh) serving from 1972 to 1976 and then was called as Rector of Truro Church in Fairfax, Virginia from 1976-1989. During that time, Truro grew in size to more than 3,000 members with an operating budget of over $3 million, half of which was spent on Missions and Outreach. He was founding member of S.O.M.A. (Sharing of Ministries Abroad), an Anglican ministry seeking to bring renewal to indigenous churches, as well as one of of the founders of Trinity Episcopal School for Ministry, in Ambridge, Pennsylvania. A strong leader in prolife and church renewal movements, he has also sought to build bridges between diverse groups in the church. “I am an evangelical in the tradition of John Stott, and my ministry has been one of building bridges between renewal-oriented Episcopalians and traditionalists, moderates and liberals,” Bishop Howe wrote when he stood for election to the Executive Council of The Episcopal Church in 2009. His diocese has been noted for it’s diversity, while still remaining a beacon for biblical teaching and a commitment to Lambeth 1.10. 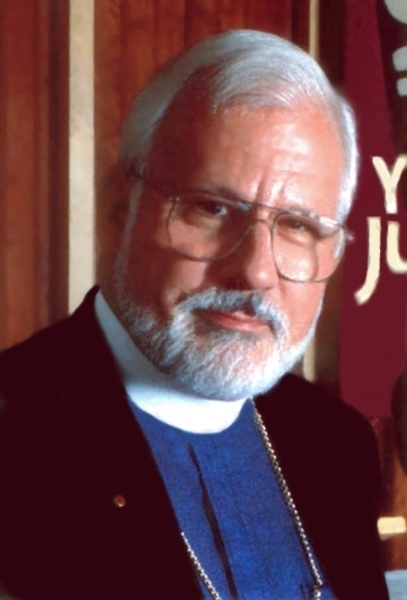 He co-authored the 1988 Resolution on Abortion and the Sanctity of Human Life adopted by the 69th General Convention of the Episcopal Church in Detroit. He is former President and Chairman of the Board of the National Organization of Episcopalians for Life (NOEL) and he is a former president of the Fellowship of Witness. In addition, he has served as the National Chaplain to the Order of the Daughters of the King which is made up of both TEC and ACNA chapters. In the Bishop’s Address to the 42nd Annual Convention of the Episcopal Diocese of Central Florida, Jan. 29, the Rt. Rev. John W. Howe announced his plan to retire in April 2012. Bishop Howe called for the election of his successor, the Fourth Bishop of Central Florida, in a Special Convention to be held Nov. 19 at the Cathedral Church of St. Luke, Orlando. Bishop Howe stressed that, although the diocese will experience a change in leadership, the diocese should maintain the direction it has taken. Develop a Diocesan Strategic Plan – The resolution said, “It is the Vision of this Diocese to be fully committed to the Great Commandment and the Great Commission: to truly love God with all of our being and to go into all the world and make disciples, teaching them to obey everything that Jesus taught his original followers.” The resolution set out five specific, measurable objectives for the years 2010 – 2012, which the diocese is in the process of implementing. Create a Contemporary Worship School – The diocese held the first of what leaders expect will be annual Contemporary Worship Conferences at the Canterbury Conference Center September 16 – 18, 2010. The next one is scheduled for September 22 – 24, 2011. Create a set of “user friendly” tools for Short Term Mission Trips – This was accomplished, and is available in print, on CD, and online at the diocesan website. Many congregations have already used these tools, and others are planning to do so in the near future. Develop a Parish Discipleship Weekend – The resolution called for an in-house parish conference to call members of this Diocese to commit or recommit their lives to Jesus Christ and his kingdom, and to teach all of us how to live out a countercultural form of discipleship. Under the direction of the Standing Committee, the search for Bishop Howe’s successor will begin immediately, and will include a diocesan survey, diocesan profile, nominations, background checks, election and consecration. Bishop Howe and his wife, Deacon Karen Howe, plan to take a cruise through the Panama Canal soon after the consecration of the new bishop. The Diocese of Central Florida, based in Orlando, is a community of about 38,000 baptized members at 88 parishes and missions in 15 counties. Welcome to the Forty-Second Annual Convention of the Diocese of Central Florida! It is good to be together again, and good to be back at St. George Church and The Villages. We were last here in 2005, exactly a decade after St. George was admitted as an organized mission of the Diocese. The planting, growth, ministry, and hospitality of this congregation have been among the great joys of my time in Central Florida. So, thank you to Fr. Hugh Bromiley and all the good folks from St. George and, indeed, from around the Diocese, who have helped prepare for our time together. Thanks, too, to Andrew Walker and all the musicians and singers who have supported our worship. I have come to the conclusion that we are nearing such a moment. I am hereby calling for the election of my successor, the Fourth Bishop of Central Florida, in a Special Convention to be held in the Cathedral Church of St. Luke on November 19, 2011. A majority of the Diocesan Bishops and Standing Committees of The Episcopal Church must then give their consents to that election within the following 120 days. That will bring us into the middle of Lent, and I would like to remain “in the saddle” for one more Easter and through the 23rd anniversary of my own consecration on April 15th of next year. Given all of those dynamics, we have tentatively set April 21, 2012 as the date for our next Bishop’s consecration. We have arranged to do this in Calvary Assembly in Orlando, just as we did last time around. And that is why I said we are nearing such a moment: it is not yet at hand. We still have nearly a year and a half to go. And I intend to be very much engaged as your Bishop until the laying on of hands and the passing of the crosier in that consecration service. The new Bishop will take office immediately, and I will officially resign at that point – although I will be available to assist if he or she should desire that. These last two-plus decades of my life have been a roller coaster of joy and sorrow – but mostly joy – as we have seen God work in our midst in extraordinary ways. I came here after thirteen and a half years in one of the truly great congregations in The Episcopal Church. And, as every Bishop will tell you, leaving your parish family behind is a very difficult thing to do. The experience of being so deeply involved in the lives of parishioners and families in the midst of their great joys and their tragic disappointments, seeing them day in, day out, week after week, baptizing their children, preparing them for confirmation and marriage, praying with them in the midst of crisis, visiting them in hospital, conducting their funerals, mourning with them, and sharing the hope of the resurrection – is a privilege and an intimacy that I know no other profession can match. My fellow clergy: we are indeed most fortunate people. But to go from that to being in a different congregation every week is a shock! It took us exactly one Sunday to realize that my family would not be accompanying me on my Visitation schedule! And I also knew that those whom God calls he equips. So I began to live into the very different structures of relationships in a vastly extended family in which the Bishop is “at home” in every one of those far-flung congregations. There are a few deep relationships that develop in many of those congregations, and there is, of course, a very special relationship that the Bishop has with the clergy of the Diocese. And, by the way, you know we have some of the finest clergy in the world. Will you join me in giving thanks for them? I think he was suspicious because he had heard I was a “charismatic.” And he was greatly surprised when I visited his parish and told him that out of all the congregations I had visited his was the one most like the one I left behind! Three days from now he will have been my Canon to the Ordinary for eighteen years. A better friend and a better partner in the gospel you could not find. Please join me in giving thanks for Canon Ernie Bennett. I want to ask the other members of our staff to stand, and let me mention them by name: (hold your applause until I am done) The Venerable Kristi Alday, Archdeacon, Chuck Dunlap, Disaster Relief Coordinator, Deacon Karen Howe, Director of Cathedral Audio, Marilyn Lang, Secretary to Canon Bennett, Carolyn LaPointe, Financial Assistant, Eric Moulton, Youth Ministry Officer, Cindy Muldoon, Receptionist and Administrative Assistant, Earl Pickett, Diocesan Administrator, Joe Thoma, Communications Officer, and Melanie Walters, Secretary to the Bishop. Let me tell you, they work tirelessly on behalf of all of us. They will see something that needs to be done, and they will just do it. Nobody asks, “Who is responsible for this?” – they just do it! They are simply a wonderful group of people and a great team to work with. Join me in giving thanks for them, as well. I am often asked, “What is the best thing about being a Bishop?” and “What is the worst thing about being a Bishop?” My answer always is: they are both the same! A crisis develops in a parish: a disagreement between the Rector and the Vestry, some kind of financial mismanagement, a violation of boundary lines, a problem between a parish and its parochial school – or whatever. A crisis: that’s the worst thing. But the Bishop just showing up begins to give some hope: we’re not in this thing alone; someone has been here before, we can get a handle on it. That’s the best thing. Most of the time the folks in a local congregation are not very aware of the Bishop, the Diocesan machinery, or the Diocesan staff. But at three major points in the life of a parish we become deeply involved. First, when a congregation is being formed the Diocese is at least the midwife, if not the birth mother. Becoming organized, raising finances, acquiring land, and building the first building is virtually never attempted without the help of the Diocese. Second, when there is a change in the leadership of a parish the Bishop, the Canon, and the Diocesan staff come alongside the Vestry and the Search Committee, walking with them through every step in the process. And third, as I have already mentioned, when there is a crisis of some kind the Bishop and the staff almost inevitably become involved. We try to handle things as discreetly as possible, but we are right there in the middle of them. For most of my time here we have been on an upward trajectory, and after splits in six of our congregations over “national issues” in 2008 and 2009, I believe we are greatly into recovery, and the arrows are moving forward and upward again. How wonderful it was to begin our time together this weekend with the welcoming of Shepherd of the Hills as a parish! Exactly sixteen years ago yesterday we welcomed the congregation as an organized mission, but they hit a bump in the road in 2003. Fr. Ladd Harris had retired to Florida, and he thought his ministry at Shepherd of the Hills was going to be singing in the choir! Instead he became God’s man to lead the congregation through a wonderful recovery. In the last twelve months they have simultaneously built a magnificent new building which is almost ready to be dedicated, called my good friend Bishop Jim Adams to be their Vicar and now their Rector, and achieved parish status! Congratulations, and well done good and faithful servants! As we begin this period of Diocesan transition it was not by accident that I asked Julian Linnell to be our preacher at the opening Eucharist. We are about mission, and it would be hard to find someone whose ministry more fully epitomizes mission than does his. Thank you, Julian, for reminding us so clearly that the mission of Jesus Christ remains at the very center of our calling. It is also no accident that running parallel to this Convention the Department for Student Ministry is offering its “Town Hall” gathering for youth ministry leaders, Sunday school teachers, and Christian Education leaders. Bringing our youth and young people into an informed commitment to Jesus Christ remains a central priority of this Diocese. So, while over the next few months we will be preparing for a change in leadership I am totally committed to maintaining our direction. Develop a Diocesan Strategic Plan – which we did, and Convention adopted it almost unanimously last year. We said, “It is the Vision of this Diocese to be fully committed to the Great Commandment and the Great Commission: to truly love God with all of our being and to go into all the world and make disciples, teaching them to obey everything that Jesus taught his original followers.” We laid out five specific, measurable objectives for the years 2010 – 2012, which we are in the process of implementing. Create a Contemporary Worship School – which we did, and we held the first of what we expect will be annual Contemporary Worship Conferences at the Canterbury Conference Center September 16 – 18, 2010. The next one is scheduled for September 22 – 24, 2011. Create a set of “user friendly” tools for Short Term Mission Trips – which we did. It is available in print, on CD, and online at our diocesan web site. Some of you have already used these tools, and others are planning to do so in the near future. Develop a Parish Discipleship Weekend – an in-house parish conference to call members of this Diocese to commit or recommit their lives to Jesus Christ and his kingdom, and to teach all of us how to live out a countercultural form of discipleship. “The weekend is titled “Discipleship Weekend.’ However, rather than focusing on prayer and Bible study (which is often what ‘discipleship’ classes teach), this is deep discipleship. It is ‘Discipleship 401,’ not ‘101.’ The weekend focuses on the Christian life rather than Christian belief. This Discipleship Weekend calls us to holiness. I remind all of us that in calling for the development of this Weekend we also resolved that every congregation will hold such an on campus retreat, using these materials, sometime in the next two years. My thanks, on behalf of all of us, to Fr. John Liebler and the members of the Parish Weekend Commission for the hard work that went into developing these materials. (In all honesty, this was mostly John Liebler’s work: a gift of love from him to the Diocese.) Please contact him directly to obtain the materials. And please do use them. I have no intention of loosening my grip on any of that vision and agenda. And I ask you to recommit to it with me. I want to say a few things about our work today. We have more resolutions before us than we have had for a number of years. Some of these have been generated by changes in the Title IV “disciplinary canons” of the national Episcopal Church, and some seek to address ambiguities in our own Diocesan canons. The current national disciplinary canons were patterned on the military code of justice. And it was argued that the Church could do better than the military. Perhaps so. But it is my opinion that the new canons give far too much authority to the Bishop of a Diocese over his or her clergy, and they give unprecedented authority to the Presiding Bishop over the other Bishops of the Church – and there is a tremendous loss of “due process” in their implementation. If a Diocesan Bishop, or the Presiding Bishop, is a wise and caring person there may be no danger in these new canons. But I think there are few of us who might not be tempted to misuse the enhanced powers given to the Bishops and the Presiding Bishop to act against those with whom he or she disagrees. I will tell you plainly: I do not want to have this enhanced authority given to me in my dealings with our clergy. Nor do I welcome this intrusion into the life of our sovereign Diocese of the unprecedented authority of the Presiding Bishop. (And I have told her so.) It is a radical revision of the polity of The Episcopal Church from its inception. So, we propose to do two things that are in tension with each other. We propose to bring our Diocesan canons into compliance with the new national canons insofar as that is possible under the Constitution of The Episcopal Church. But, at the same time, we ask that this Diocese memorialize the next General Convention to revisit Title IV in that it is inconsistent with the Constitution of The Episcopal Church. The Constitution says that NO bishop – other than the Diocesan – NO bishop, including the Presiding Bishop, may intervene in the internal affairs of a Diocese, and the new canons say precisely the opposite. The Constitution trumps the canons, so either it – or they – must be revised. So, while all but one of the resolutions coming before us this afternoon may seem complicated, they are actually pretty straightforward: revise our canons for clarity and to be in conformity with the national canons, AND call upon General Convention to bring the national canons into conformity with the Constitution. We can debate all of this if you like, but we really need to just pass the resolutions. They have been very carefully crafted by our Constitution and Canons Committee, and reviewed by the Standing Committee in its role as Resolutions Committee for Convention. The other resolution, R-1, is a Recommitment to Mission, and I hope we will pass it unanimously. It is in the best interest of your Bishop (though it is one of the most difficult decisions I have ever made). “There’s a trick to the Graceful Exit. It begins with the vision to recognize when a job, a life stage, a relationship is over – and to let go. It means leaving what’s over without denying its validity or its past importance in our lives. “It involves a sense of future, a belief that every exit line is an entry, that we are moving on, rather than moving out. I told the Standing Committee last month that my love for this Diocese is so exquisite that it hurts! If I could somehow, miraculously, make it all happen all over again I would do so in a heartbeat. Thank you for honoring me, and supporting me, for these past twenty-one plus years. I love you, and I pray that as “all good things…” begin to wind down they may wind up giving birth to even greater things in this great Diocese of Central Florida. Bishop Howe calls for the election of the 4th Bishop of Central Florida. The Committees for the Diocesan Profile and Transition Process are selected by the Standing Committee in consultation with the Deans and Deanery Presidents. the Profile Committee, and the Transition Committee. You and/or members of your congregation may volunteer the first two weeks of February to participate in positions the Standing Committee needs to fill, but please remember we may not be able to place everyone who volunteers. and it is made available to the entire Diocese of Central Florida. These surveys, with instructions, will help you, as an individual, state what you see as the future of the Diocese and how that should be reflected in the gifts, skills and vision of the next Bishop. Deanery Forums are held by the Deans and Presidents of each Deanery. These open discussions will help you, as Deaneries, create our Diocesan Profile. The Deans and Presidents will summarize these discussions with those in attendance and send the summaries to the Profile Committee. The Profile is prepared from the surveys and Forums. a brief overview of 1) our Diocese, and 2) the kind of Bishop desired by the people of the Diocese. The Profile and nomination instructions are sent to the Convention delegates. The delegates of the Convention will serve, in effect, as the Search and Nominating Committees. The Standing Committee receives the nominations. Nominations received in accordance with the nominating instructions, and nominees who have passed a background examination, will be placed in nomination at the electing Convention. This process is entirely open to anyone meeting the nomination standards and the background check standards. Election at the Cathedral, Saturday, November 19. Profile and background information for all nominees will be available on the Diocesan website. The delegates of this Convention will be the delegates at the electing Convention. The first ballot will determine the final slate of the nominees. the Retirement of Bishop John W. Howe. This entry was posted in ACNA, Anglican News, Diocese of Virginia, Episcopal News, http://schemas.google.com/blogger/2008/kind#post, Lambeth Conference. Bookmark the permalink. ← Another way forward to peaceful settlement? Scout – it was. Unexpected as he had indicated he would be with us for several more years. We L2 ask all of your prayers that the process would be blessed with God's will – that we all would listen and hear it. And that others would honor our choice for our next bishop. We have direct knowlege of Bishop Howe's gifts in these parts LL2, from his service in the Diocese of Virginia. I lament the loss of his voice in the Episcopal Church, as I did the loss of my schoolmate, Bishop Beckwith of Illinois. I understand, however, the Bishop Howe will remain active in certain contexts within the Church. That is good news.